*Ski Cross (SX) is an action-packed and adrenaline-fueled sport that made its Olympic debut as a medal sport at the 2010 Winter Games in Vancouver-Whistler. Prior to the Olympics, ski cross had already established itself as a hugely popular TV sport thanks to events such as the X-Games. While Ski Cross is still young, Canada has a rich history of success in the sport. Since 2009, Canada has been viewed as one of the strongest Ski Cross nations in the world, racking up 137 World Cup medals, 6 World Championship Medals, 15 X-Games Medals, and 3 Olympics medals. Ski cross courses have both naturally occurring terrain and artificial features. Course building is a type of art and always keeps the athletes on their toes. World Cup courses typically feature a combination of big jumps, small jumps, rollers, and bank turns. In 2015 FIS also introduced a sprint race format, which is a short course offering multiple jump/roller lines for athletes to choose from. Aside from the course, what sets ski cross apart from other sports, including alpine skiing, is the fact that there’s more than one skier racing down the course. Four to six racers go head to head, at the same time, with the aim of finishing first. The unique combination of technically-challenging terrain and head to head racing make ski cross a thrilling spectator sport. In World Cup, World Championship and Olympic races, athletes complete a qualification round that is run as a time trial, with racers skiing the course solo. Based on their qualification time, athletes are placed into brackets for heat racing. In heats, four athletes race head to head down the course, with the top two from each heat advancing to the next round. Finals consist of a small final, with athletes competing for places 5 to 8 and a big final which determines the winner of the race, following by 2nd, 3rd & 4th. HOW CAN I SIGN UP IN ONTARIO? For current (i.e. this season), paid members with AOA you may sign up for any AOA scheduled alpine and ski cross training and/or competition. 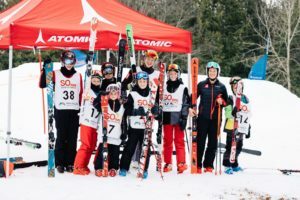 You will notice on our schedule some ski cross events are labeled as Snowboard Ontario (SO) events, including the Snowboard Cross Series which include entry-level ski cross events for the U14 and older age groups (U14, U16, U19). These events require an additional per event registration with Snowboard Ontario – please click here to do so. Please note: Snowboard Ontario will require that you create a profile to ‘register’ but you do not also need to pay the SO season membership fee to enter these races.